S Shankar's 2.0, starring Rajinikanth and Akshay Kumar, collected over Rs 500 crore worldwide in the first week (2.0 opened in theatres last Thursday) of its release, tweeted trade analyst Ramesh Bala. It is behind only SS Rajamouli's Baahubali: The Conclusion, which collected over Rs 500 crore in five days. 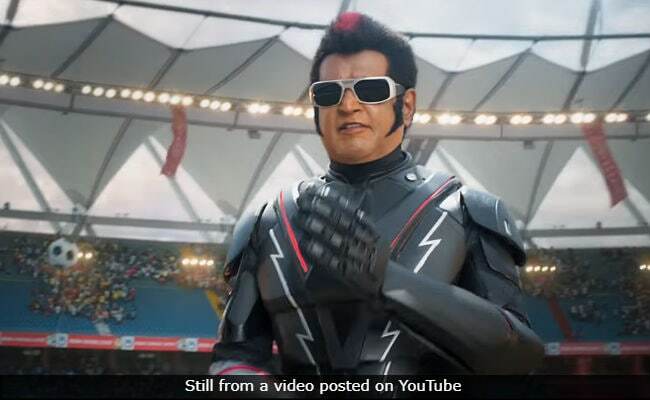 The detailed break-up of the box office collection will be shared later but as of Wednesday, Ramesh Bala said that 2.0 collected over Rs 120 crore overseas while in India, it made over Rs 360 crore. 2.0 is the sequel to Rajinikanth's 2010 blockbuster Enthiran and it appears that the film is destined for a historic run at the box office. Meanwhile, the film's Hindi version maintained its "super-strong hold at the box office," tweeted trade analyst Taran Adarsh on Thursday. 2.0 collected Rs 9.50 crore on Wednesday bringing the first week total to Rs 132 crore. In it's 1st week, #2Point0 has crossed 500 Crs at the WW Box Office..
#2Point0 continues its winning streak... Maintains a super-strong hold on weekdays... Thu 20.25 cr, Fri 18 cr, Sat 25 cr, Sun 34 cr, Mon 13.75 cr, Tue 11.50 cr, Wed 9.50 cr. Total: 132 cr. India biz. Note: HINDI version. In a separate post, Taran Adarsh also said that the Hindi version of 2.0 has surpassed the lifetime collection of the Hindi version of Baahubali: The Beginning (Rs 118.7 crore) and that after Thursday, "it will emerge as Akshay Kumar's highest grossing film. "2.0 is the second highest grossing film (Hindi dubbed version) and it is also Rajnikanth's highest grossing (Hindi) film ever. * Rajnikanth's highest grossing film ever [#Hindi]. * Will emerge Akshay Kumar's highest grossing film today [Thu; Day 8]. 2.0 was made on a budget of over Rs 500 crore and it recovered Rs 370 crore before the film release through the sale of its digital and satellite rights. 2.0 is the story of ornithologist Pakshirajan (Akshay Kumar) who turns against human beings blaming their callous use of technology for the depleting bird number. Dr Vaseegaran (Rajinikanth) is compelled to take his robot Chitti (also Rajinikanth) out of retirement after it was dismantled at the end of Enthiran because it turned rogue.